Customizable, ready-to-assemble systems have made wall paneling and wainscoting more accessible than ever. Custom paneling has always been a luxury item. It is labor and cost intensive, since creating a profile means multiple components —baseboard, rails, stiles, panels, caps—to create a visually interesting or historically accurate look. Each component requires cuts and fitting. This work time is consuming and very precise. The margin for error is slim, and it isn’t a project that most homeowners undertake for themselves. So, paneling and wainscoting have remained a finish for the well heeled or the well trained. Now, however, luxury has at last come to the masses in an affordable and customer-friendly package, with the advent of custom designed, ready-to-assemble paneling systems like those sold by New England Classic. Customers first visit the website or work with their builder or designer to select among the designs and profiles. On the website, downloadable design forms ask for pertinent info, including room dimensions, wall measurements, locations and heights of doors and windows, and any irregularities. An in-house design team then generates a design, installation materials, a materials list, and a set of project drawings. The materials list is then taken to a local dealer or, for customers located 20 miles or more from a dealer, submitted directly to the company. A complete kit of parts is cut and packaged for pickup or delivery in two to three weeks. Panels and components are available finished or unfinished, paint ready, or with a high-end veneer. Panels range in size from 30 inches to full wall height. 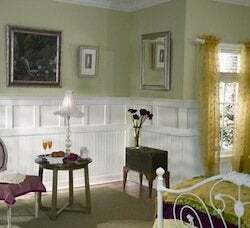 Wainscoting comes in standard 30 or 32-inch heights and a variety of widths. Once on site, the installation is easy. “The materials are all routed out in the back and everything slides together like a children’s puzzle,” says Farr. “Once the bottom rail is in place, you are just sliding pieces together. The only tools you need are a hammer, nails, a caulk gun for adhesive, and a miter saw for corners,” Farr says. Homeowners and do-it-yourselfers need only know how to determine the center of a room and mark it, how to check for level and plumb, how to apply panel adhesive and nail on the bead. Instructions are included with every order and an installation video is available. The panels are engineered from medium density fiberboard (MDF) and faced with a wood veneer. The trim pieces such as stiles, rails, and caps, all come wrapped in a melamine paper to protect against damage. MDF is made from wood fiber waste material, making it easy to machine into the necessary profiles. 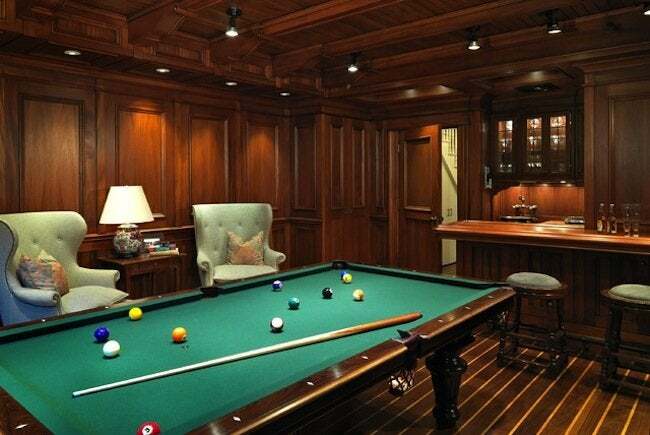 The wood veneers may be Oak, Maple, or Cherry. This wood-veneer layer is bonded to the MDF, which makes for a sturdier, more stable product than natural woods. There is virtually no shrinkage or warping. Paneling and wainscoting jobs are calculated by the square foot. While prices depend on the style and finish selected, a New England Classic system can range in price from $7.50 per square foot for unfinished or paint-ready components to $25 per square foot for high-end Regal Cherry. Even at that price, a ready-to-install paneling system is a beautiful and affordable option for homeowners wishing to add luxury, beauty, and aesthetic value to their homes. “It’s an inexpensive way to add perceived value to a room and a home,” concludes Farr.